The 14th Amendment to the U.S. Constitution reads, in part, "No State shall make or enforce any law which shall abridge the privileges or immunities of citizens of the United States; nor shall any State deprive any person of life, liberty, or property, without due process of law; nor deny to any person within its jurisdiction the equal protection of the laws." This is the so-called Equal Protection Clause. It ensures equal treatment before the law of all U.S. citizens in all states. 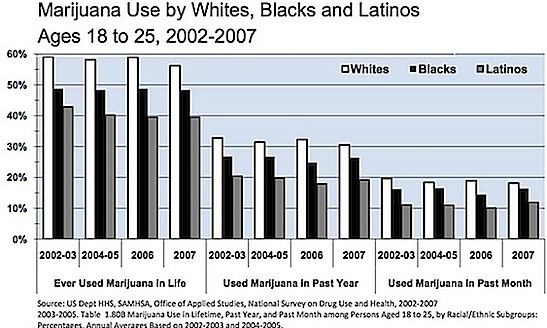 Panderbear notes in the bar chart of marijuana use by whites, blacks, and latinos that in every use frequency category and every date range, the percentage of pot use in the 18 to 25 age group is highest among whites and lower for blacks and latinos. If justice is blind and equal protection rights are being rigorous upheld Panderbear would think that arrests for marijuana possession would reflect a similar relationship. 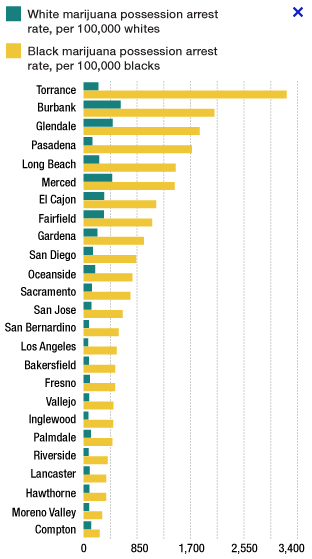 According to the following chart of marijuana possession arrest rate by race in various California cities, that is not even close to the reality. Although marijuana use is higher in whites than blacks, the arrest rate for blacks is anywhere from 2.5 to 12 times higher than for whites. What's going on here? There is definitely some kind of selection bias leading to the higher arrest rates for blacks - racial profiling or good old-fashioned racism or both? Those who pander about "playing the race card" should take note. The election of President Obama did not mark the end of the era of race-based discrimination. Panderbear admits the case for a breakdown of the Equal Protection Clause would be stronger if the data for use and arrests applied to the exact same population. And there may be other contributing factors. Nevertheless, Panderbear thinks the general result of selection bias in enforcement of possession laws would turn out to be robust. This constitutes another excellent reason to legalize possession of marijuana - the laws are not being equally applied and result in racial discrimination. End the crime; end the discrimination.